Today's heroine is Estella Latham, a woman who has made a unique impact on Kilimanjaro history, though I have been unable to locate much information about her – not even a photograph. Estella and her husband Kingsley Latham climbed Kilimanjaro in July 1925. In her journal she recorded that they were warned repeatedly about the dangers of attempting such a thing, and the days before the climb she had nightmares of "cold and cruel glaciers, of tumbling down awful precipices into bottomless abysses, or climbing up impossible ice walls by tooth and nail!" Due to an outbreak of smallpox along the route via Bismark's Hut (the present-day Marangu or "Coca Cola" Route), they needed to climb via the harder and steeper route to Johannes Hut. 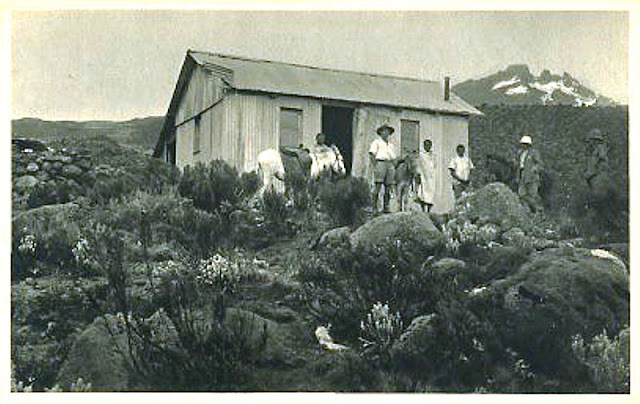 This hut no longer exists, but scholars have estimated its location as being along the rarely traveled Maua route: a direct servicing route for the Horombo Huts. I did find one description of an available Kilimanjaro climb via this route which has the summit attempt on day 3… not very appealing! "I deemed it wiser to say nothing of my trying for the top! I led people to believe that I was merely going as far as the last hut – Pieter's [sic]. I could foresee the storm of protest and warnings that would surely have descended on my head had I suggested that I too had dreams of ascending Kibo." 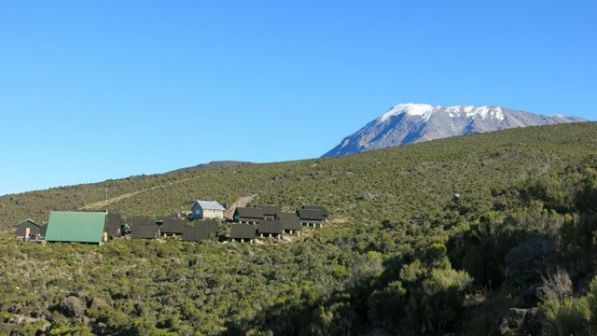 They left Moshi on July 6 with a guide, Mfore, a cook, Hamisi, and several porters. Hamisi told Estella that he was convinced that there must be money at the summit "—nothing else could induce us to be so mad as to climb it." They climbed through the forest in a thick mist which turned to rain before they reached the Johannes Hut at 2900 meters. The hut was already in decline when the Lathams visited. Estella wrote, "This hut must have been very comfortable once but vandals have torn out the woodwork, ceiling and floor boards and now only the corrugated iron room and four walls remain." As uncomfortable as they were, the group stayed there another day waiting for brighter weather. They arrived at Peter's Hut (3720m) on July 9, relaxing there for an extra day to acclimatize. Estella wrote: "From the ridge Kibo looks a very long way off," and noted that she was "looking forward anxiously to tomorrow, as to my mind it will be the real test of what I can stand. I think that if I can get to the cave I can get to the crater rim (one dare not write top)." Horombo Huts, 2013. Image from Kilimanjaro Rongai 2013. I'm 99.9% sure that the light-colored building is the original Peter's Hut. Hey, it's the little things. 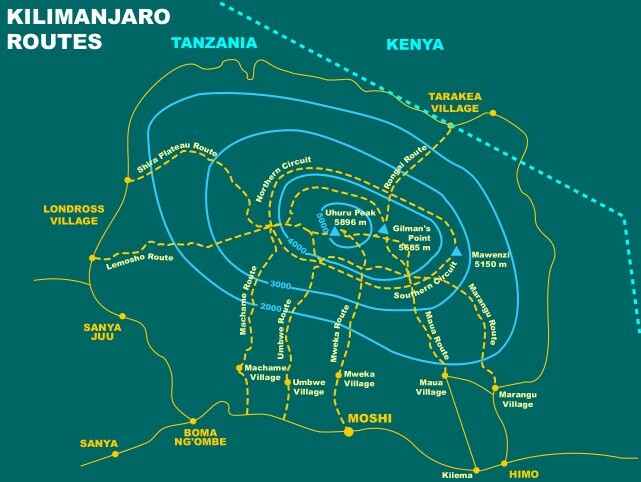 On July 11 they crossed the saddle ("a desolate stony desert") and stayed in a cave Stella called "Nyumba ya Muungu", "The House of God". The group was starting to weaken; her husband Kingsley was "feeling puffed and tired" and both Mfore and Hamisi were ill. They stayed an extra day there to regain their strength before making their summit attempt. "What tomorrow will bring forth is the burning question. We dare not even imagine the humblest of victories. The climb from here does not look big, but in our puffed condition it will take us all our time." They left the cave at 4:30am on July 13 in bitter cold. They attempted an unsuccessful route around a rock buttress that tired them out, but they lit a fire, had some breakfast, and rested before continuing up. "The climbing was very tiring, heavy shale into which we sank up to our ankles, had to be contended with in addition to the altitude." Things were made easier by reaching the snow line next to the Ratzel Glacier, "green-white and dazzling". Reaching Hans Meyer's Notch [now Gilman's Point] was a thrill, "and tired as we all were it put fresh life into us." 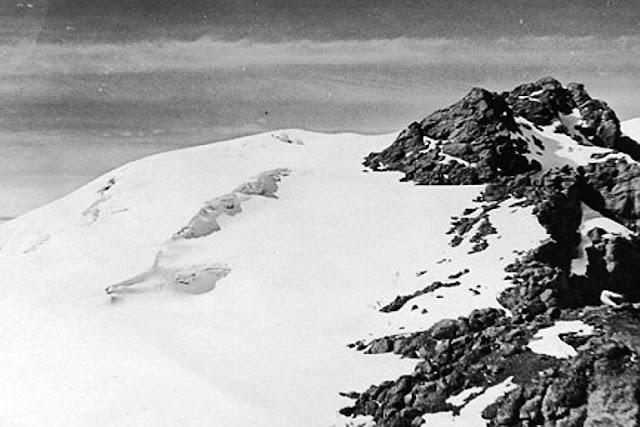 They opened the record box, examined the flags and notes left by Gilman and other previous climbers, snacked on chocolate, and then continued along the crater rim toward Kaiser Wilhelm Spitz [now Uhuru Point, the true summit]. They first hiked along the ice rim on the crater, but then felt unsafe so walked on the rocks. They were about halfway to the summit when Kingsley had to turn back. "We were at this time at the base of the highest rock pinnacle in the crater rim. We climbed this pinnacle, leaving our record in a glass jar. On our recording card we named the pinnacle "Point Stella", provided it had not been previously named." Stella Point as seen from Gilman's Point, 1945. Image from Mount Kilimanjaro Wiki. Reached this point at 12.10 p.m. on Monday 13th July 1925 .accompanied by natives Filipos and Sambuananga. We then attempted to reach KW Spitz but were unable to reach it due to partial snow blindness, mountain sickness and exhaustion on my part. My wife was fit to reach the Spitz and she led on the return trip here as I was unfit to lead. In her honour I have named the point we reached “POINT STELLA”. It bears 290 degrees E of North i.e. 70 degrees West. They headed back around the crater rim to Gilman's Point, rested briefly, and then descended to the cave. Being too tired to go farther that night, they overnighted there, descending to Peter's Hut on the 14th, and returning to Moshi on July 15. In her journal Estella praised "tireless Filipos", the porter who carried a rucksack to the crater rim, "and went sockless and in native sandals". Estella didn't make another summit attempt on Kili; however, in 1937 Kingsley did. During this attempt Kingsley collapsed, lost consciousness, and had to be carried down the mountain. When he woke up in the hospital, he had almost complete amnesia. He returned to London for treatment, but took years to recover. His nephew wrote that Kingsley "had, like a child, to learn once again how to read and write; for a long time he had difficulty choosing the appropriate word for items he knew well. He gradually recovered most of his faculties and survived to become a successful coffee farmer; he died in his sixties on his farm in eastern Zimbabwe many years later." Estella Latham is the only woman to have a geographic location on Mount Kilimanjaro named after her. I can only hope that I get to see it in person when we climb later this year! Latham, Michael and Gwynneth. 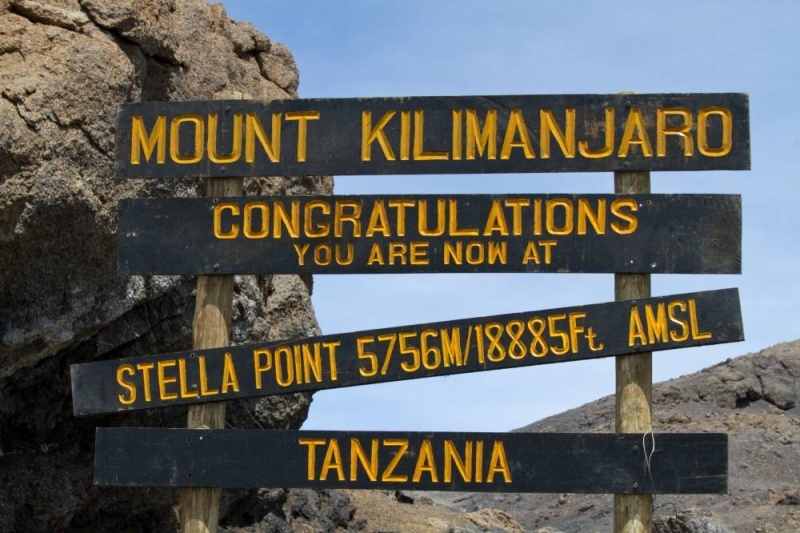 Kilimanjaro Tales: The Saga of a Medical Family in Africa. London: The Radcliffe Press, 1995.